At Bay Area Pet Pals we get asked a lot of questions, and we also ask many questions in order to provide exceptional services for your pet(s). Here are some of the questions that we are frequently asked about our business and services. 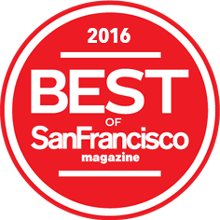 Why should I choose Bay Area Pet Pals for Dog Walking, Pet Sitting, or small Dog Boarding? We are licensed, bonded, and insured – as well as highly experienced. When you hire us for Pet Sitting or Dog Walking, your pet can comfortably remain in his or her own familiar home and follow their normal diet and exercise routine. We train our pet sitters and dog walkers in Pet CPR, Pet First Aid, and they follow carefully prepared guidelines. We work to schedule each of our employees so in the event of an emergency, illness, or vacation – each Pet Pal has a backup to cover the work. 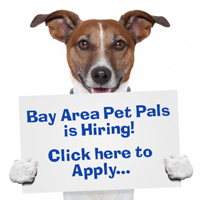 Bay Area Pet Pals employees must pass our screening requirements and be caring, reliable, and trustworthy. You can learn more by checking out our ‘About Us’ page. What is the Bay Area Pet Pals service area? Our Service Areas include: Atherton, Belmont, Foster City, Menlo Park, Redwood City, San Carlos, and parts of San Mateo, Stanford, Palo Alto, and Redwood Shores. Some service areas may require additional travel fees, please contact us to see if we can help you. What kinds of animals does Bay Area Pet Pals provide care for? We care for most animals, as long as they don’t pose a danger to our employees. We prefer not to provide services for any animals that have a history of biting or attacking other animals or people. For cats, due to liability requirements, we only provide Pet Sitting Visits for cats who can remain indoors during your absence. Our Dog Boarding service is for only dogs that weigh 40 pounds or less in most cases. What information shall I provide during the initial consultation? The consultation time allows us to get to know about you and your pets, as well as time for you to ask us questions. To get started, simply contact us. To begin your confidential Client Profile, you will need to have the following information readily available: Your pet’s date of birth, Veterinarian information about your pet’s likes, dislikes, temperament, diet, and other details. Pet medication information (if applicable): name of medication(s), directions for administering medications, and Veterinarian name, address, phone number. For Dog Walking & Pet Sitting: Information about accessing and navigating your home and your key storage lock box. For Dog Boarding: Pet Shot Records. How is Bay Area Pet Pals experienced with pets? Owner Lynda Mortensen has over 35 years working with her pets and caring for the pets of others. She has completed training in pet first aid and pet CPR. All of our qualified Pet Pals Team Members have pets of their own and each possesses a big love of animals. You may learn more about our Pet Pals on ‘Our Team’ page. We accept Cash, Check, PayPal, Venmon, or Zelle. For Pet Sitting and Dog Walking services we have a Pre-Payment Policy in which fees for need to be paid at the time of your reservation. For Dog Boarding, full payment is due within 7 days from the time of the booking. May I receive a refund for services if I return early or leave later than planned? We carefully maintain schedules for our Pet Pals and for our Clients, thus refunds are not applied in most cases. Due to the necessary planning process, our commitments are often booked weeks in advance. What are the Bay Area Pet Pals Cancellation Policies? Cancellation of any scheduled Dog Walking Visit must be made a full 24 hours in advance for credit to be provided. For example: If the walk is scheduled for 2pm, you must cancel prior to 2pm the day before. Cancellation of any scheduled Pet Sitting Visit: A minimum of 7 days advance cancellation is required in order to receive full credit. However; in the months of November, December, and January – a 2 week advance notice of cancellation is required. All cancellations must be submitted in writing via email. Cancellation of any scheduled Dog Boarding: A minimum of 14 days advance cancellation is required in order to receive full credit. Does Bay Area Pet Pals offer services on holidays? We do not perform regular Dog Walking Visits on the following National Holidays: Christmas Eve Day through New Year’s Day, Martin Luther King Jr. Day, Presidents Day, Easter, Memorial Day, 4th of July, Labor Day, Thanksgiving Day and the day after Thanksgiving. However, in special situations, we may be able to accommodate a Holiday Dog Walking Visit with advanced scheduling. Please contact us to discuss. For Pet Sitting Visits: Holidays require the addition of $15.00 per visit for the following National Holidays: Christmas Eve, Christmas Day, New Year’s Eve, New Year’s Day, Easter, Memorial Day, 4th of July, Labor Day, Thanksgiving Day and the day after Thanksgiving. This helps us to reward our Pet Pals who are willing to spend their holiday time with your pets. How will my Bay Area Pet Pals Pet Sitter or Dog Walker enter my home? In order to provide our clients and their pets with the most reliable service, Bay Area Pet Pals requires that each client utilize a key storage lock box to hold a minimum of two keys, or two sets of keys, to their residence. Two are necessary in order to ensure that a backup key is always available in case one breaks or becomes lost. The storage box must have a combination code access and we recommend one with at least four digits. The use of a secure lock box provides you with the peace of mind that your key will always be at your home and secure. It is important to provide at least two identical keys (or two sets of keys) inside of the lock box. A backup set is necessary in case a key breaks or if your Pet Sitter or Dog Walker accidentally becomes locked out of your residence. Should this occur and you have not provided us with a backup key(s), we will be required to call a Locksmith and there is a minimum $125 fee for this service – as well as for the time the sitter must remain with your pet(s). Costs are also subject to increase during holidays and weekends. Please remember to test all of the keys to ensure that they work properly prior to placing them into your lock box. We realize that some clients may not be able to have a lock box. If you cannot for any reason please contact us so that we can make other arrangements for you. Read more about key storage lock boxes here. Can I schedule future services or visits with my Pet Pal directly? All of our scheduling is performed via an integrated system to ensure that no pet is left waiting and no Pet Pal becomes overbooked. All Bay Area Pet Pals services must be scheduled with our main office – please contact us for all reservations or cancellations. Do not contact your individual walker or sitter. What is included during a Dog Walk, Pet Sitting Visit, or Dog Boarding service? Dog Walking: Choose this service for Monday-Friday Dog Walking Services only. This service does not include: feeding, caring for other pets, or home sitting services. If you will be away or traveling; please choose from our Pet Sitting or Dog Boarding Services. Pet Sitting: Travelers choose this service for pet and home care. This service can include care for cats, dogs, fish, and other small animals. Pet Sitting services can also include Dog Walks, Pet Feeding, Pet Play Time, Watering Plants, Cat Litter Box Cleaning, Small Cage Cleaning, and General House Sitting Services. Dog Boarding: This service is for dogs less than 40lbs that are to stay at the home of Bay Area Pet Pals for walks, care, feeding, and play time. We do not board cats. Please visit each of our individual service pages for more information. Will Bay Area Pet Pals always perform pet visits or dog walks at the exact time requested? While we work to ensure that all of our client’s pets are cared for at the time they need it, sometimes minor adjustments need to be made in the case of traffic congestion, inclement weather, or delays caused by another client. This is why we typically ask you for a “window of time” that works best for our arrival. For pets that require medication to be administered at a specific time, we will carefully schedule accordingly. Please let us know at the time of your reservation if specific times are critical for your pet. For Pet Sitting Visits, please notify us of any special instructions or requirements for your pet or home and we will work to meet your requests. “Early” and “After Hour” visits (before 8am and/or after 7pm) can be scheduled for an additional fee of $15.00 per visit. For Dog Boarding Services please schedule early in order to ensure availability. Quoted fees are determined by your specifically stated pick-up and drop-off times. If there is any change in your drop-off or pick-up time, please notify us immediately so that we may make adjustments to our schedule and your payment record. If dogs are picked up after 11:30am on their scheduled departure day, an additional daycare fee applies. Will I be able to have the same Pet Pal each time I use your services? We do strive to ensure that the same Pet Pal – who has already become familiar to you and your pet(s) – will provide services for you each time. However, if the Pet Pal is out sick or on vacation your substitute Pet Pal will be similarly trained and have been instructed about your pet(s) and your home via notes within your private Client Profile. Can I get updates about my pet while I am away? Sure, we would be glad to provide you with periodic email and/or text updates about your precious one. What happens if I did not leave enough supplies or food for my pet(s)? We will first notify you in the event that there are not enough pet supplies or food so that you are aware to find out if it may be located in another area of your home. It is necessary that you provide a ready supply of pet food, treats, poop bags, and medicines for your entire time away. If your Pet Pal has to go shopping to purchase food or other items, there is an additional $50 fee as well as the cost of goods. We are Bay Area Pet Pals and we look forward to serving you and your pets!